The current below-average levels of financial market volatility provide interesting opportunities for hedgers and investors alike. Aside from some short-lived turbulence, financial markets have been exceptionally calm over the last year. Equity markets have been in a stable uptrend, economic growth has been solid, inflation has been low, and central banks have maintained their accommodative monetary policy. All these factors have helped to push financial market volatility to multi-year lows. The VIX – a key measure of US equity market volatility – has been hovering around the 10% level for most of this year, while the long-term average of the VIX is closer to 20%. While short-term spikes in risk triggered by unforeseeable events such as the recent escalation of rhetoric between the USA and North Korea can always occur, it appears that volatility is likely to stay below average for now. The availability of liquidity and the ability of companies to absorb shocks are key long-term drivers of financial market volatility. As central banks retain an accommodative monetary policy stance and companies have reduced their financial leverage, both of these factors support a continuation of the current low volatility regime, short-term volatility spikes aside. However, volatility does move in cycles, so once we see a more sustained tightening of monetary conditions, it is likely to start increasing gradually. 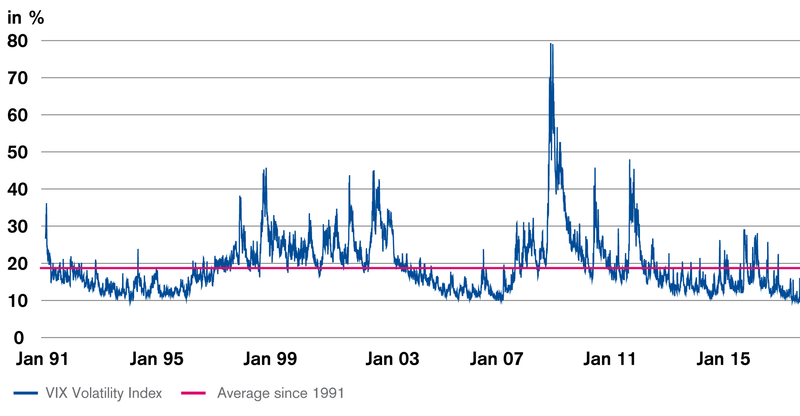 The current below-average levels of financial market volatility provide interesting opportunities for hedgers and investors alike. Volatility is a key measure for option prices, and low volatility means that buying options is cheap. Investors who are concerned about equity valuations following the long rally can take advantage of the low volatility to purchase downside protection cheaply using put options or related structures. Conversely, cash-rich investors who missed the equity rally can take advantage of low volatility to purchase upside participation in equity markets with very limited downside risks using call options or related structures.